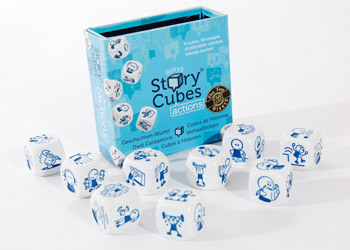 Rory’s Story Cubes®: Actions does not require Rory’s Story Cubes® in order to use them. They can be played on their own straight out of the box, or mixed with other sets of Rory’s Story Cubes®. Made to the same high quality as the original set, Rory’s Story Cubes®: Actions are inked in dark blue. This makes them easier to sort from your Rory’s Story Cubes® after use. With Rory’s Story Cubes®: Actions, you will have more fun practising a new language. You will be able to practise telling stories set in the past, present and future! Try starting your stories with 3 cubes (as opposed to 9 in Rory’s Story Cubes®). This makes it easier when learning a second language. Randomly mix in with the original Rory’s Story Cubes® to create a more action packed set of 9 cubes.